Disclosure: I was compensated for my work with Dollar Tree, but all opinions are my own. It’s almost time to start thinking about summer! I know our snow here has only recently melted, but I’m already planning ahead for the busy summer season. 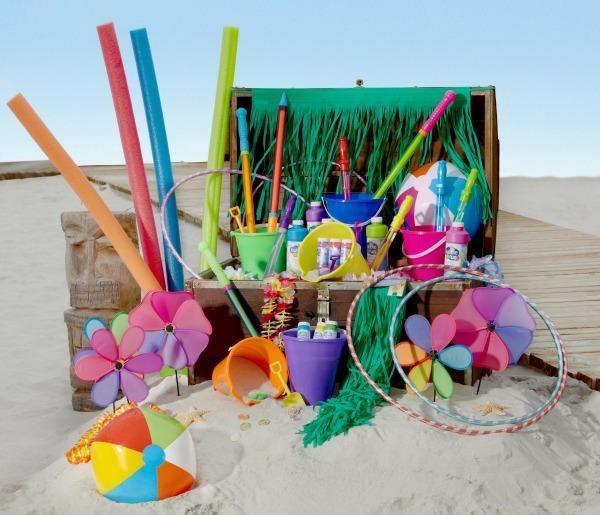 Dollar Tree is also getting ready for summer with the launch of their new Summer Fun collection! It consists of everything you need to create a summer experience you’ll never forget. Set the mood with their summer tableware and party supplies, keep kids busy with toys and dress yourself in a colorful pair of flip-flops. You won’t to miss all that the Summer Fun collection has to offer. The Summer Fun collection launches on April 21st in Dollar Tree stores and at DollarTree.com with a Flip-Flop Frenzy! You can outfit your whole family with a pair of flip-flops in a variety of solid colors including blue, black, pink, lime, turquoise, yellow, purple and orange or colorful patterns and styles. Colors and patterns vary by store. With your Dollar Tree flip-flops, you can even create fun personalized styles like the ones below! The Summer Fun Flip-Flop Frenzy Craft Contest is another great reason to pick up some flip-flops! You can win a $500 Dollar Tree gift card. Submit a photo of your original flip-flop craft at DollarTree.com to enter. Just think of all the goodies you could buy with that gift card! If you can, try to get to the store when they open so you don’t miss out on any of the Summer Fun products. Products are only available while supplies last so hurry in! Stores open at 8 am in your local time. If your Dollar Tree store is in a mall, make sure to check out the posted mall hours. All Summer Fun products cost $1 each so hurry in and stock up for summer. You can’t beat these prices! I think I’d pick up a pair of flip flops in a few different colors for John, my girls and myself. They are perfect to wear to the beach and for backyard pool parties. Learn more about the Dollar Tree Summer Fun collection and see what amazing deals you can snag to create your perfect summer experience. This is a sponsored conversation written by me on behalf of Dollar Tree via Burst Media. The opinions and text are all mine.